As I have probably waxed lyrical on this blog before, one of the great evolutions of gaming recently have been the inclusion of the independent scene once again. Whilst developing cartridges, CD’s and DVD’s have been tough, the fact you could download simple games, put together cheaply, for pennies by keen folk has seen some great creative games come out. Heck, artisan masterpieces such as Braid & Limbo couldn’t exist without this scene, it’s wonderful. One game that sits on the XBox Indie Game scene is FireFly Vegas, a game that is firmly entrenched in it’s retro roots. Lets get one thing straight – this game isn’t a epic masterpiece like Mass Effect. You don’t absorb yourself in it’s complex storyline. However one thing is for sure – the game is good for a quick blast. 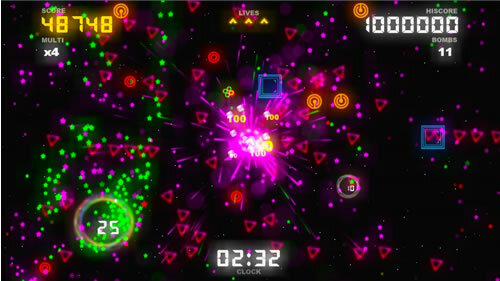 The game is a mixture between Robotron and Asteroids. 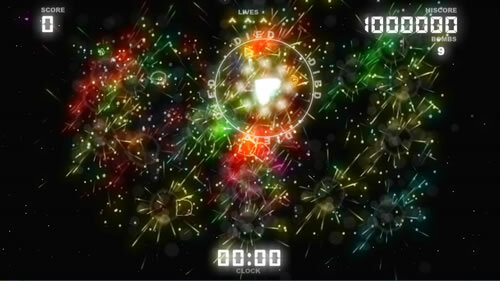 You play a spaceship that has to shoot almost everything in sight. There are powerups that appear along the way, as well as a “jump” button (that I must admit I never managed to get work once during the time playing this review). Instead of a hyperspae as in Asteroids, protection is provide by a finite supply of smart bombs that destroy everything on screen. The controls are unbelievably solid, with the game adopting the Robotron controls of 1 control for movement and the other is for shooting. You get full 360 shooting, which is pretty solid as well, so not screaming at the telly like with Robotron. There are two game modes – time attack, which gives you five minutes and three lives to score the highest score possible, and survival, which gives you three lives to score the highest score possible. Scores are achieved by shooting anything and collecting bonuses. Both game modes are fine, however I found that there was no differential between them, which is important, as both games were fairly tough – it was tricky to survive more than about 2 minutes in both game modes. Furthermore, with scoring being between 10-100 per target & the default high score being 500,000, it can be tricky to make a name for yourself. If you are a glutton for punishment, there is also an expert mode, which changes the game in that instead of your ship rotating on the landscape, the landscape rotates on the ship. Both game modes are included in this mode, it works actually surprisingly well, still tough but works well. One thing that needs to be mentioned is the game is absolutely gorgeous. Great graphics and a thumping soundtrack, this adds to the experience and really lends to it’s Robotron roots. So in conclusion the game is pretty good for a blast, but frustrating when you play it for long periods of time. Also I’d prefer a little more differential between the “time attack” and “survival” modes, though the expert mode is actually rather fun. It’s a tough retro style game that is well worth picking up, particularly if you enjoy either Robotron or Asteroids. But be prepared to die a lot. The game is available on XBox Live Indie Games for between $1-$3 from RockMint Games, who you can follow on Twitter here and on Facebook here. Buy FireFly Vegas from XBox. I’ll be releasing an update soon to improve longeavity and reduce difficulty as well as an upgraded PC release with multiplayer and new modes. Couple of tips – collect the neutrinos the enemies leave behind (they will attract towards you when not firing) – collect 100 for an additional score multiplier – for Big scores! Jumping will cost you 2 multipliers so you can only jump when you have a min of 2. Choose your weapon selection carefully as some are better than others against different enemies.